The production of this tea was made under the supervision of the famous tea scholar from Yunnan, Mr. He ShiHua. Cakes produced by Mr. He were primarily limited editions and are mostly in the hands of pu-erh collectors. Brewed to a pomegranate hue, this tea is clean, brothy, with a rich mouthfeel. Every sip is followed with a quick "Hui Gan" (return sweetness) that lasts for a long time. The "qi" is calming, yet palpable. Every time I drank this tea, I lost count of how many steeping I got from the leaves. 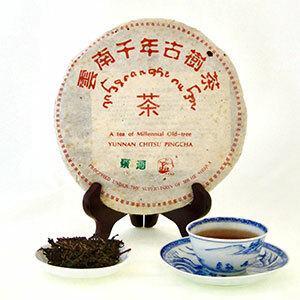 The characteristics exhibited by this tea are those of a well-produced and well-aged pu-erh. NOTE: 5g sample includes free shipping. Use 5 grams of leaves per 5 oz of water. Rinse the leaves with boiling water and steep to times shown below.